High-end cookware is expensive, but Cristel pans have a big advantage. Cristel thinks that your cookware should flexible. Not flexible in the sense that it bends, of course, but instead flexible in the sense that you can use Cristel cookware for a larger variety of tasks than your standard all-metal set. This means that even when you compare a Cristel set to a high-end set from All-Clad or Demeyere, the Cristel set pulls ahead with a few unique, distinctive features. Most notably, Cristel’s pots and pans feature removable handles that can be exchanged between any two pieces of Cristel cookware. Pots and Pans With Removable Handles? 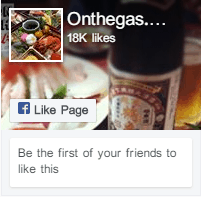 If this is your first time encountering this idea, you might be confused. After all, why would you want to remove the handles on a pot or pan? It’s not that hard to keep things clean around the handle, and you’ve probably had bad experiences in the past with a screw-on handle that keeps coming loose. So why is this feature a positive? Cristel’s removable handles are definitely a feature that grow on you after you try them out. The manufacturer has designed a simple and effective snap-on system that locks the handles in place while you use each pot or pan. When you’re done, you can simply pop them off to make it easier to store your cookware in your cupboard. This is a pretty big upside in a crowded kitchen like mine — I always feel like I’m playing Tetris when I try to fit all of my pots in one cupboard. Storage isn’t the only advantage that Cristel’s handles offer. For me, the more important factor is versatility. I can use a long handle to maneuver a pot on the stove, use shorter pot handles to more easily lift and control a frying pan that’s absolutely loaded with food, or remove the handles from a pot in order to fit it in the oven or use it as a serving dish. 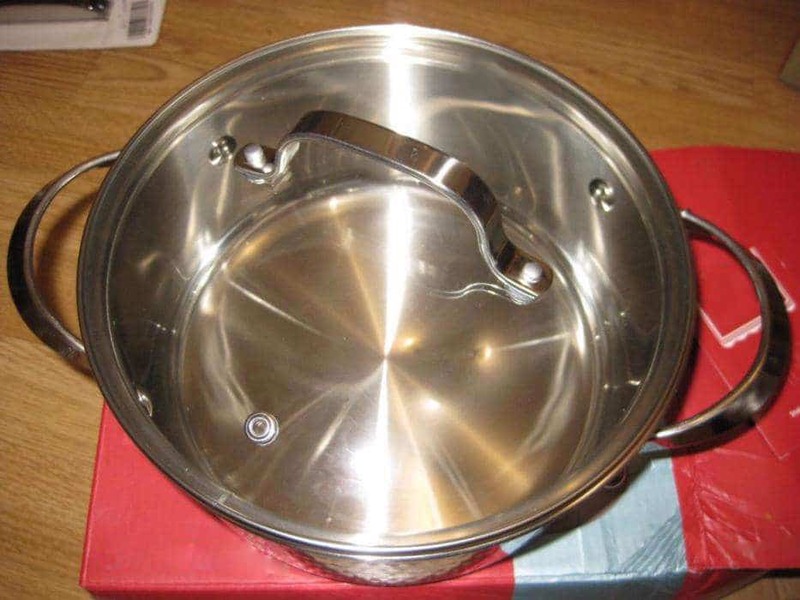 You can’t change the whole functionality of a pot or pan entirely, but you can certainly expand its usefulness a little bit by changing or removing the handles. After a couple weeks of owning a Cristel set, this sort of modification will be second nature and you’ll wonder how you ever lived without it. Cristel is very, very French. The company has a complicated origin story: it was originally founded in Japy, France, but it closed down in the early 1980’s. Some of the former employees banded together and fought a long, difficult battle to try to restore the company to its former glory. Over the next few years, they worked with a consultant and an engineer to develop a brand of distinctive high-quality cookware with the extra convenience of removable handles. This means that while Cristel has many decades of history, it only has three or four decades of experience manufacturing these particular pots and pans. Nevertheless, Cristel has quickly become a French classic. Their cookware includes some of the finest options coming from France over the last several years. Here are some of the sets and pieces that you should pay particularly close attention to. Cristel’s Casteline line is one of its most distinctive options. If you’re looking for something that’s a bit nicer than All-Clad in many respects, this is the line to choose. Before we dive into things too deeply, it’s important to note that this is a 13-piece cookware set that includes 4 removable handles. With five pans, four lids, and four handles, it’s definitely a little bit smaller than the piece count might lead you to believe. That said, the handles are absolutely things that you’ll use — these aren’t cheap nylon utensils that you’ll throw into a drawer and never touch. I’d also like to briefly mention that this is a pretty expensive cookware set. I think it absolutely beats most cheaper sets in terms of features and quality (as well as many cookware sets that are more expensive), but it won’t make your food magically taste better or shave hours off of your food prep. Instead, it’s simply a bit nicer to use and has slightly better heat distribution. There’s nothing wrong with choosing a cheaper Cusinart or even Calphalon set and saving a fairly big pile of cash. Again, I think the Cristel set is nicer, so it’s a better option if there’s room in your budget. but that certainly won’t be the case for everyone. If you’re wondering why this price makes any sense at all to anyone, it’s for one reason: longevity. A well-made all-metal cookware set like this one will easily last you for the rest of your life. Non-stick pots and pans, by contrast, tend to last for two to five years before the coating wears off. This includes diamond non-stick pans, ceramic cookware, and anything you’ve ever seen in an infomercial. 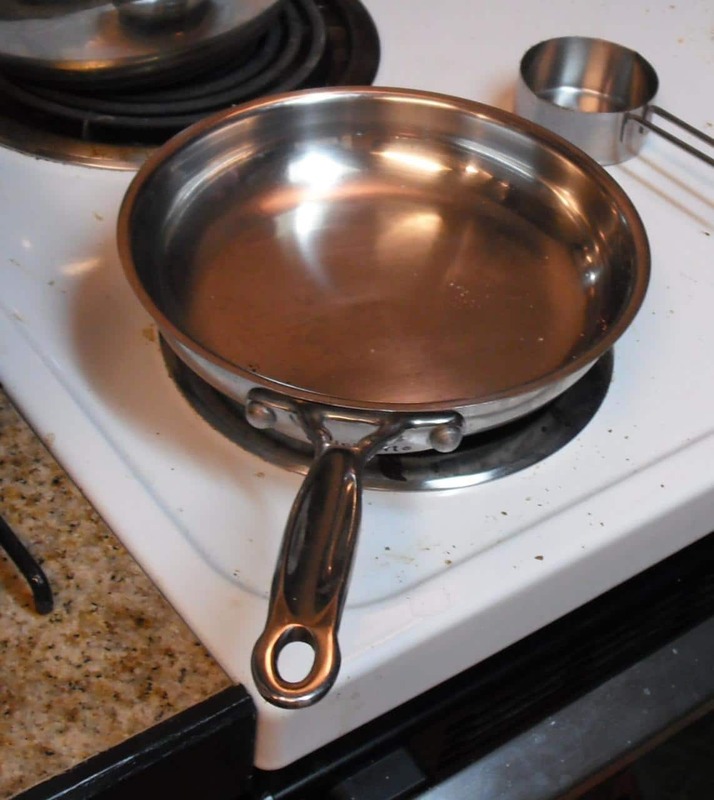 Professional chefs essentially treat non-stick cookware as disposable, since they put so much wear on it that it hardly ever lasts six months. Even in a professional kitchen, this Cristel set will last for many years. This means that you’re not really paying very much money on a per year basis. A cheap non-stick set might be less than 1/5th of the price, but you could easily have to replace that set more than five times over the course of this Cristel set’s lifetime. In other words, it’s a fairly sane investment into your future. You’ll pay more money up front, but you’ll save money over the next decade or two. First, these pots and pans are made with a fairly unique style of construction. They’re essentially slightly thinner-than-normal tri-ply pots and pans that are bonded to an additional layer of aluminum and stainless on the bottom. This means that the base of each pot and pan is 5-ply, while the sides are 3-ply. There are quite a few advantages to this style of construction. First, the pots and pans are lighter than you might think at first glance. There’s a bit less material in the side walls of the cookware, and that really adds up. These aren’t ultra-light pots and pans by any means, but they’re noticeably easier to maneuver than typical multi-ply options. The other advantage has to do with thermal weight. A thin tri-ply set might heat up quickly and somewhat evenly, but it’ll cool off really quickly when you toss a refrigerated steak onto your preheated pan. It’s possible to compensate for this problem, certainly, but the best solution is to make sure your pan can store more heat so that it won’t cool off. 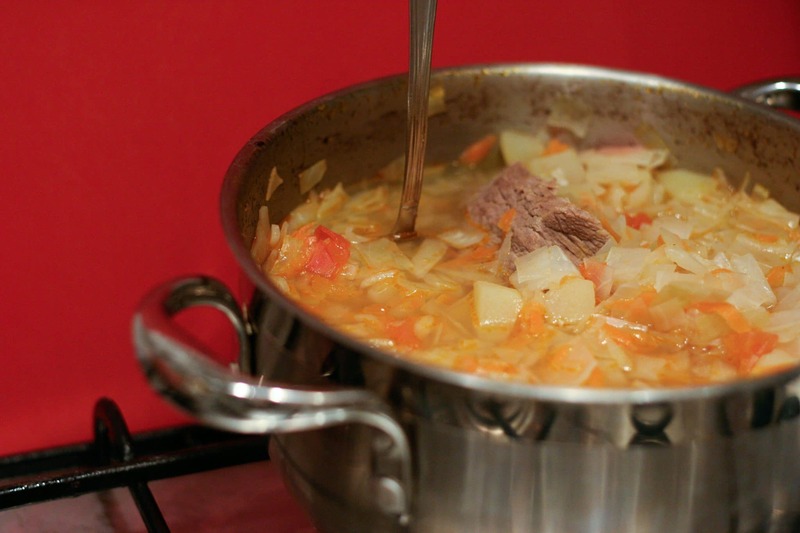 Cristel accomplishes this effect with the added two layers in the bottom of the pan. 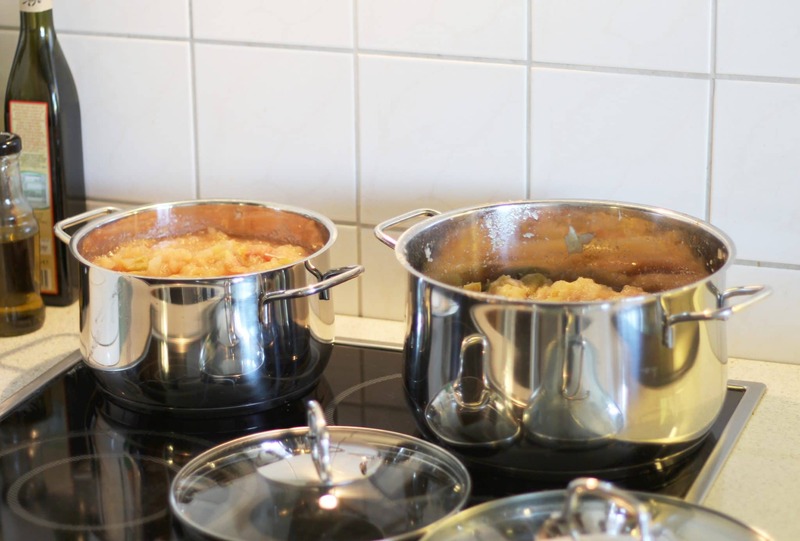 Not only does the extra metal help ensure that heat is distributed evenly, it also provides a nice place for each pot and pan to store a bit of extra heat. When it comes to ultra-precise cooking, this is a double edge sword. 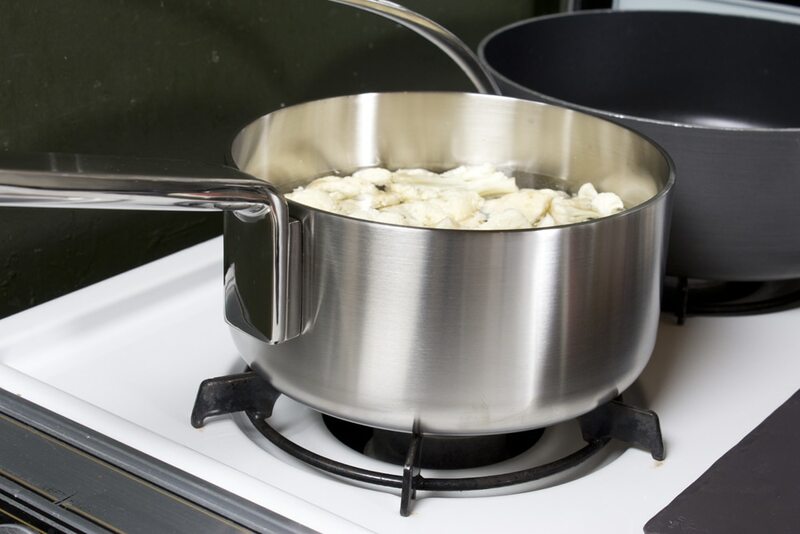 It means that it’s easier to hold your pots and pans at a specific temperature — especially when you’re adding cold or hot food — but it also makes it harder to make small adjustments with your burner. You may have to turn your burner off completely or even move the pan to a different burner in order to cool it off. Luckily, the low weight of the Cristel Casteline set makes this an easy task. Honestly, other than this mild issue with cooling, I can’t think of any downsides to this style of design. You don’t really need extra material in the walls of your pots and pans, since it’s the base that does all of the heavy lifting. Cristel has managed to find a clever way to reduce weight while simultaneously increasing cooking performance. It’s a subtle improvement over the typical tri- or even five-ply competition. I spoke about the detachable handles at some length earlier, so I won’t dive too deeply into that now. Let me just say briefly that this is one of those things that you don’t know you’re missing until you try it. After a year with this Cristel set you’ll wonder how you ever managed to live with the fixed handles on your other cookware. While I wholeheartedly recommend this set for most kitchens, there are two caveats. First, if the price is a major concern, there’s nothing wrong with getting a cheaper set and revisiting this Cristel package when you’re feeling a bit more flush. Again, while it outperforms a Cuisinart set in many measurable ways, it can be difficult to justify spending the extra cash if money is tight. Second, this is NOT a non-stick set. Non-stick cookware definitely has a place in both home and professional kitchens, especially if you like to cook things like eggs and you dislike having to babysit your food or spend a few minutes scrubbing a pot or pan. If you know you’re not going to want to take the time to learn how to cook on a stainless steel cooking surface, pay close attention to your cooking temperature, and cook with an appropriate amount of oil or cooking fat, you probably should make sure that you have non-stick cooking options. This might mean augmenting this Cristel set with a non-stick pan or two, augmenting a non-stick set with a Cristel pot or pan, or avoiding stainless entirely and going with all non-stick. Bear in mind that non-stick cookware will die after a few years, so you’ll almost certainly end up replacing it. Cristel has done a wonderful job of producing French cookware that’s accessible, easy to use, and incredibly stylish. If you’re after a set of high-end cookware made in France, this is definitely one of your best options. It’s even dishwasher safe! While I’ll often recommend checking out a deep saute pan to introduce yourself to a high-end cookware brand, I think Cristel’s pots might do a better job of showcasing the brand’s strengths. The French cookware manufacturer made a name for itself by producing cookware that doubles as a serving vessel, and you can explore this feature a bit more with a saucepan than you can a frying pan. All of Cristel’s options are excellent, but I think that the Casteline line beats the others by a little bit. This is because of how the base is made. The Strate and Mutine lines lack aluminum cores in the side walls of the pots and pans. This isn’t a total deal-killer by any means, but it does mean that they’re slightly inferior. Since Cristel charges a pretty similar amount for most of its pots and pans, the Casteline collection is a clear winner. 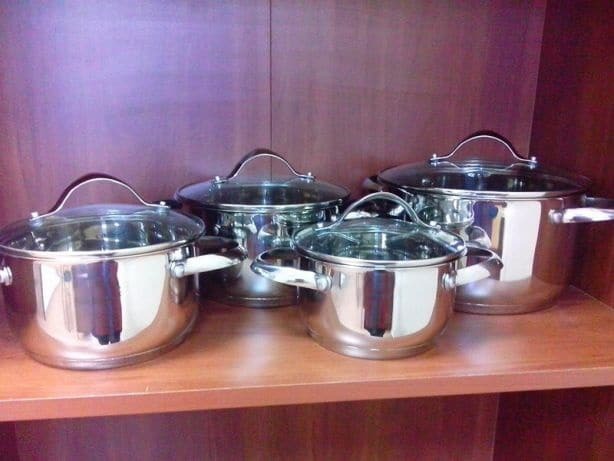 These saucepans are available in a multitude of sizes from 1 to 3.5 quarts. Be sure to consider the types of dishes you make and how much space you want your pot to take up when choosing a size. While these Cristel pots take up less cupboard space than conventional pots they still have to go somewhere. Cristel’s modern pots come with handy measuring marks on the inside, stylish glass lids, and their distinctive removable handles. This has a number of upsides. For one, you can store each pot in a much smaller space than their fixed handled cousins. You can also remove the handles while you cook, meaning they’ll stay cool on the countertop. When it’s time to move your pot, simply snap the handle back in and proceed as normal. While this feature is nifty on the stove, it’s even neater in the oven. Cristel’s cookware is oven safe to about 400F, meaning you can start dishes on the stove and finish them in the oven (or vice versa). Keeping the handles on the counter will make it much easier (and safer!) to remove your food when it’s done. A Cristel pot will last you for decades with proper care. 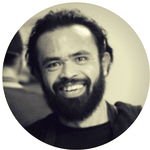 You’ll have many years to explore all of the advantages afforded by its unique features. If they sound like something you’d be interested in, give one of the Casteline pots a try! Cristel isn’t the oldest brand on the market, but it’s one of the most innovative ones. Their detachable handles and high-quality metalwork combine to make some of the finest pots and pans on the market. If you’re after French cookware that actually offers some tangible benefits over the American and European competition, try Cristel. Dalstrong Knife Review: The Best Consumer Knives On The Market? Mercer Knives Review – The Best Inexpensive Knives For New Chefs?